Be the first to share your favorite memory, photo or story of Coolidge. This memorial page is dedicated for family, friends and future generations to celebrate the life of their loved one. 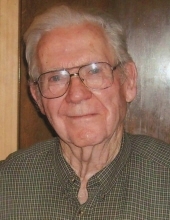 Coolidge Fugate, 92 years of age of Raysal, WV, passed away Saturday, January 12, 2019 at his home. Born January 11, 1927 in Butterfly, KY, he was the son of the late Elijah and Eva Collins Fugate. Coolidge was a United States Army Veteran, having served during WWII, a retired coal miner and member of the UMWA. He enjoyed going to church and was a member of the Bartley Church of Jesus. A loving father, grandfather and great grandfather. In addition to his parents, he was preceded in death by his wife Ruby Rutter Fugate, son Timmy Fugate, daughter Linda Kendrick, two sisters and five brothers. Survivors include his daughters Sharon Slone of Combs, KY, son Jimmy Wayne Fugate and wife Brigett of Viper, KY; son-in-law Clifford Kendrick; grandchildren Michael Shane Combs and wife Hope, Traci Combs, Mindy Brewer, Marcus Kendrick and wife Leanne, Jason Kendrick and wife Diana, Shannon Kendrick and wife Janelle and great-grandchildren Tiffany Kendrick, Christopher Kendrick, Jacob Kendrick, Jason Kendrick, Briana Eversole, Morgan Brewer, Kelsie Davis and husband Tommy Lee, Kaydance Davis and Kaellyn Davis. Funeral service for Coolidge Fugate will be held at the Jesus Church Of Bartley in Bartley, WV, Thursday, January 17, 2019 at 12:00 noon with Reverends Pete Woods and Charlie Kennedy officiating. Burial will follow in the Rowe Cemetery on Rock Ridge in Paynesville, WV. The family will receive friends at the Jesus Church Of Bartley, Wednesday, January 16th after 6:00 p.m. with evening service to be held at 7:00 p.m. The family of Coolidge Fugate have entrusted the care of their loved one to Shortridge-Ramey Funeral Home of Grundy, VA.
"Email Address" would like to share the life celebration of Coolidge Fugate. Click on the "link" to go to share a favorite memory or leave a condolence message for the family.